We’re giving your oven a break today with a recipe that is fabulously frosty and completely no-bake. We’re celebrating National Ice Cream Sandwich Day! Yes, an entire day devoted to this chilled childhood classic. Not that we need a designated day to indulge in a treat so deliciously tempting. But really, I think we can all agree – the only thing better than a frosty bowl of ice cream is ice cream sandwiched between two chewy cookies. Especially if the ice cream and cookies are homemade! In honor of the occasion, we’re sharing an ice cream sandwich recipe that is seriously over the top. It comes to us from Jennie Schacht, author of I Scream Sandwich . A drool-inducing book filled with tempting combinations of homemade ice creams and creative cookies. Everything from classic chocolate cookies filled with creamy vanilla ice cream to lemon curd ice cream on soft ginger cookies. Oh my deliciousness! Jennie redefines the ice cream sandwich and today’s feature is just one of many ingenious recipes you’ll find inside the cover. Try your best not to lick the screen as we dive into these babies! An ice cream sandwich made from chocolate chip ice cream packed between… two layers of cookie dough! 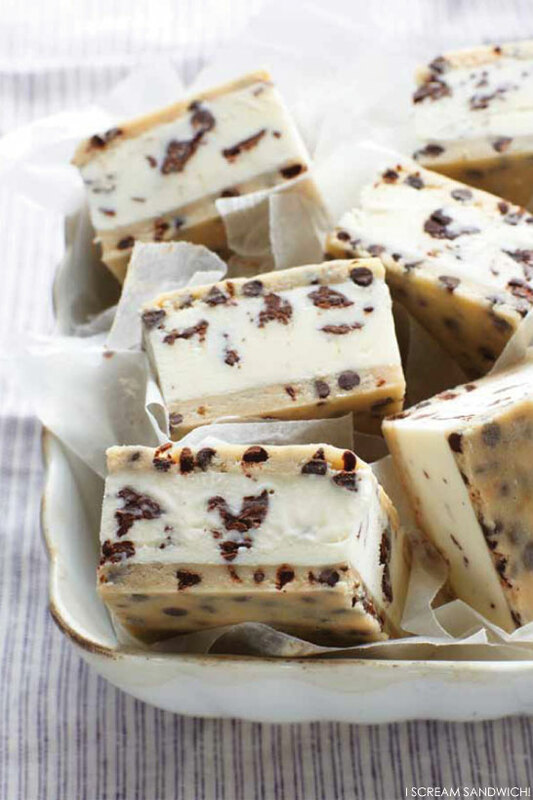 Yes, that’s cookie dough – ice cream – more cookie dough. Now that is an ice cream sandwich worthy of it’s name, Cookie Monster! Whisk ½ cup (120 ml) of the milk with the sugar, syrup, tapioca, and salt in a medium saucepan until no lumps remain. Stir in the remaining 1½ cups (360 ml) milk and the cream. Heat the mixture over medium-high heat, stirring with a heatproof spatula, until it begins to steam and slightly bubble at the edges. Adjust to a simmer and cook, stirring constantly, until the mixture thickens to the consistency of a cream sauce, about 3 minutes longer; do not fully boil. Transfer the mixture to a metal bowl set over a larger bowl of ice and water. Stir occasionally until the mixture is cool, taking care not to slosh water into the bowl. Stir in the vanilla, then cover and refrigerate until very cold, at least 2 hours. Transfer the bowl to the freezer for the last half hour before spinning it. Freeze the mixture in an ice cream maker according to the manufacturer’s directions. While the mixture spins, melt the chocolate and oil in the microwave or in a small saucepan until you can stir it smooth. Let cool to room temperature, keeping it fluid. With the machine running, drizzle in the cooled melted chocolate during the last minute of spinning. (Alternatively, drizzle the chocolate over the ice cream as you transfer it to the container, folding it in with a spatula or ice cream paddle to break it up as you go.) Transfer the ice cream to a chilled container, cover, and freeze until firm but still spreadable, at least 4 hours. Line an 8-inch (20-cm) freezer-safe baking pan with two pieces of lightly oiled waxed paper or parchment paper so the papers extend well beyond the edges of the pan on all four sides as a sling for easy removal. Scatter half of the dough into the pan and use your fingers to pack it into an even layer. Top with lightly oiled waxed or parchment paper, oiled side down. Place another lightly oiled waxed or parchment paper in the pan, leaving 2 inches (5 cm) of paper extending at each end. Scatter and press the remaining dough into an even layer. Top with lightly oiled waxed paper or parchment, oiled side down. Freeze the dough layers until firm, at least 1 hour. Use the flaps to lift out the top cookie dough layer. Peel the paper from one side and loosely replace it. Flip the layer over and do the same to the other side. Repeat with the second cookie dough layer. Place both layers back in the freezer. Form sandwiches in the baking pan, using the bottom two pieces of parchment extended on all sides to line the pan. Place one slab of cookie dough top-side down in the pan and spread softened ice cream over it in an even layer. Top with the second slab of cookie dough, top-side up, pressing firmly to evenly distribute the ice cream. Wrap tightly in the plastic wrap and freeze until very firm, at least 6 hours or overnight, for easiest cutting. When the ice cream is very firm, take the pan from the freezer, remove and unwrap the block, and place it on a flat cutting surface. Use a sharp, heavy knife to cut the block into 4 strips in each direction to form 16 bars. To make 64 bite-size treats, cut each bar into quarters. Dip the knife in hot water and wipe it dry between cuts. WOW! These look delish!! Pinning so I can make this weekend for sure! Thanks for sharing! You’ve picked the perfect sandwich to beat the heat. Thanks for sharing i scream SANDWICH!, and a happy National Ice Cream Sandwich Day to you and yours! Oh my YUM! I did not lick the screen (thanks for the advice! ), but am certainly drooling. Definitely will be making this the next time friends come over! The best ice cream sandwich recipe ever! I have always tried sandwiching ice cream between two baked cookies, but it never tasted like the storebought sandwhiches. These were perfect! Oh my – those look absolutely delish! Beautiful! How long will these keep in the freezer? These look absolutely wonderful! I love ice cream sandwiches! I will be trying these out. Thanks for sharing!